Has your Mac suddenly become slow or started having trouble doing the usual daily tasks? If so, you might have some accidentally installed app that isn’t helpful to your Mac. Not all of these apps are malicious, but for the sake of simplicity, I’ll call them malware here. Malware behavior ranges anywhere from giving annoying pop ups all the way to tracking keystrokes on your Mac. None of this is good or helpful for your productivity. I recently discovered an app designed to get rid of many different types of malware. It’s called DetectX. It will get rid of several known troublemaking apps as well as other miscellaneous adware. 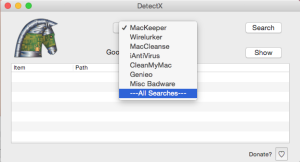 DetectX is particularly useful if you have an older Mac since it runs on Macs that are running older operating systems like OS X Snow Leopard (aka OS X 10.6). By comparison, MalwareBytes Anti-Malware for Mac and BitDefender, two other anti-malware applications which I recommend, both require OS X Mavericks (aka OS X 10.9) or newer. Go to DetectX’s website and download the app. Move the app from your Downloads folder to your Applications folder. Go to your Applications folder and double-click Detect to open it. If you’re notified that you downloaded DetectX from the Internet and asked if you want to open it, click the Open button. Select All Searches from the drop-down menu at the top center of the window. Click the Search button and wait a short while for the process to complete. If no malware is found, congratulations! You’re done. For each malware item found, click on it one time and then click the Show button. When you are taken to the Finder, delete the file that was listed in the Detect X window. Repeat steps 8 and 9 for all items found. If your Mac is still giving you random pop ups and such after you’ve cleared everything from DetectX, you may want to run Malwarebytes Anti-Malware for Mac also. See the Tech Tip on Malwarebytes Anti-Malware for Mac for more information on removing adware. Read more about adware, adwaremedic, annoyware, DetectX, mac, MacKeeper, malware, remove.